GREASE 1978. 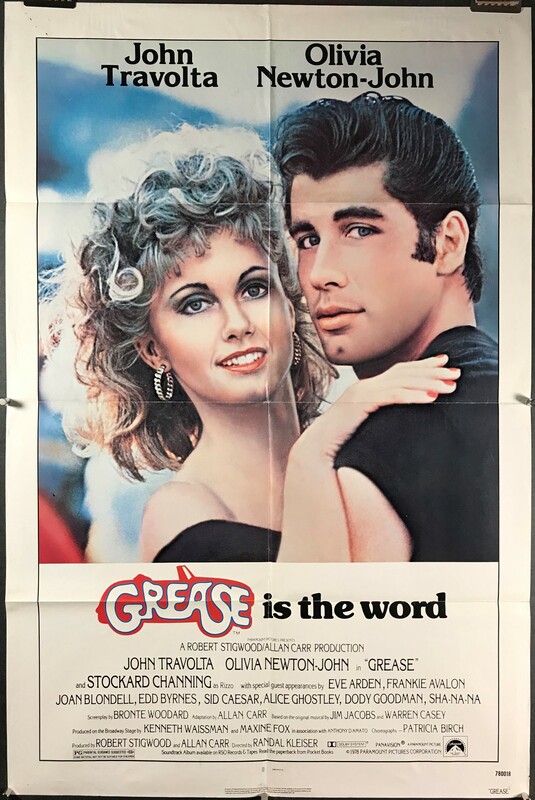 Original 1 Sheet (27 x 41” / 69 x 104 cm) folded Movie Poster starring John Travolta and Olivia Newton-John. Directed by Randal Kleiser and based on original musical by Jim Jacobs and Warren Casey. “Grease is the word.” In this classic movie, we follow good girl Sandy and greaser Danny as they fall in love in the summer of 1959 at a California beach. But when they go back to school, they unexpectedly discover they now attend the same high school – can they rekindle their romance? This folded 1 sheet poster is in very good original C8 condition. There is a small mar on the edge of the bottom right corner, small pinholes in the top two corners, some slight color loss along the fold lines, and some minor wrinkling throughout the poster, which could be taken care of during the linen backing process. Linen Backing is available for an additional $80 upon request or by adding the service to your cart below. This would produce a flat, backed poster that’s ready to display! Retouching the color along the fold lines is optional but included in the service. We linen back and frame all of our posters IN HOUSE at our studio in Katy, TX!